Sponsored: Can Mushrooms Save The Honeybee & Our Food Supply? A series of connections between bears, trees, mushrooms and bees may have led to an incredible discovery for the survival of the honeybee. 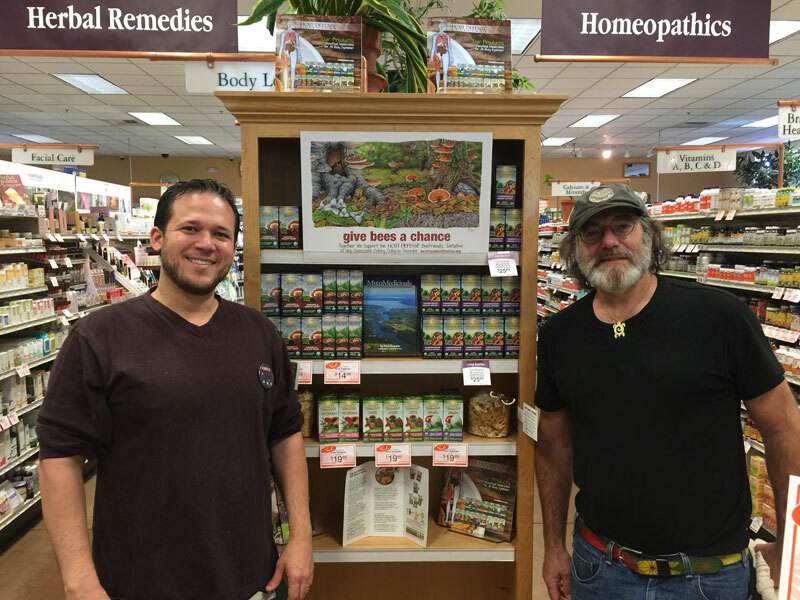 James Dills and Paul Stamets at the Ashland Food Co-op, Ashland, OR, in front of their "Give Bees A Chance" endcap display. Not so long ago our forests had huge amounts of wood debris decomposing from mycelium – a natural process for creating soil that also sustains a healthy habitat for insects, birds, bats, bees and mammals. Unfortunately, that wood debris is now being eliminated from the forests through our current logging practices and we are rapidly losing the habitat that sustains the balance of this eco-system. So what do organisms and species like the honeybee that have depended on this eco-system for millions of years do? “I study mycology and the use of fungi to help clean up the environment, and improve the immune systems of humans and animals… and I began to think: we’ve gone to the moon, we’ve gone to Mars, and we don’t know the way of the bee? I believe I can do something ‘to help the bees… ” ”“Paul Stamets, D.Sc., mycologist, author, TED speaker, passionate innovator, and founder Host Defense Organic Mushrooms. “Stamets jokes that it only took him three decades to have his epiphany about the relationship between his beloved fungi and the threatened honeybee,” Sylvia Kantor, a science writer at Washington State University writes in an article published on Crosscut.com. Several years ago, Paul and his wife Dusty were mushroom hunting in the old growth forest of Washington when they discovered a huge bear scratch on a tree (bears scratch trees for the resin) and as a mycologist, Paul knew the scratch would create an entry point for the spores of polypore mushrooms. When they returned two years later, they rediscovered the bear scratched tree only to find a red belted polypore mushroom growing out of the scratch. (This specific fungi is very active in breaking down a wide assortment of toxins, pesticides, herbicides and fungicides). The relationship between the bear, the tree and the polypore mushroom was the first of his connections. Three decades earlier, Paul was cultivating the garden giant mushroom, aka the King Stropharia, in his garden in a mycelium patch that was 12” thick. One morning while working in the garden, he was astonished to see that his bees had moved the wood chips away to expose the underlying mushroom mycelia and were sipping the droplets of nectar exuded from the mycelium. Here’s the science behind the bees and the mycelium. It sounds complicated but it is really very simple. Cytochrome P450 enzymes are the most important enzymes for detoxification. Bees have approximately 47 genes that control these Cytochrome CYP450 detoxification enzymes. Most insects have nearly 80. These 47 genes are “turned on” by p-coumaric acid. Without it, toxins accumulate, making bees sick. Bees are dependent on the fungal compounds that are in decomposing wood for their p-coumaric acid which ultimately is transferred into honey and bee bread. Through his research supported by the National Institutes of Health and the Department of Defense, Stamets found that compounds from certain polypores are effective for a variety of health applications. He later posited that these same compounds, extracted from polypores, could be applied to managed bee populations to regulate immunity and detoxification pathways associated with pesticides and other harmful environmental contaminants. In 2014, Paul Stamets presented his theory of the interconnectedness between bears, trees, mushrooms and bees to Dr. Steve Sheppard, Chair of the Department of Entomology, Washington State University. Steve credits his great grandfather, a beekeeper in Savannah, Georgia, for his own interest in bees. Although his great grandfather died when Steve was 1 year old, he left behind a wealth of bee equipment and books that provided hours of reading and imagination for an interested young reader. In college he took a beekeeping class from Professor Alfred Dietz and “I watched him spread bees around with his hand like they were a bunch of leaves or something,” Sheppard recalls. “It was fascinating seeing someone interact with these social insects that could sting you to death, but didn’t.” Sheppard has gone on to become an entomologist known for his work on the evolution and genetics of honey bees. The two joined forces, forming a research initiative called BeeFriendlyTM to help reverse these devastating declines in the global bee population that are critically threatening our world’s food security. “We are studying mycological solutions to increase longevity, reduce mite and viral burden, and improve immunity of honey bees,” says Stamets. Last year in their experiments 300 sets of bees consumed Host Defense® mushroom extracts via their feed water. The mycelium based mushroom extracts, especially Reishi and Chaga, reduced their viral burden by more than 75 percent. The most recent results show that extracts of the Amadou mushroom reduced the Deformed Wing Virus by more than 1000 times! Other mushroom species fed to honeybees increased their longevity in controlled settings from 30 percent to 100 percent depending on the life stage of the bee. Dozens more experiments are underway at WSU, including research on whether certain species of mycopesticidal fungi can kill the parasitic Varroa mites that decimate beehives around the world. “We take bees from colonies with high Varroa destructor mite levels and set up numerous test environments with fungi. We’re finding that the fungi product is killing mites without harming bees. It’s certainly encouraging . . .” says Sheppard. People who wish to support bee research can make tax-deductible donations directly to WSU at beefriendlyinitiative.org. In addition, Paul’s company, Host Defense Organic Mushrooms, will donate an additional $50,000 to this CRITICAL research, through their “Give Bees A Chance” program, based on sales of certain Host Defense products.